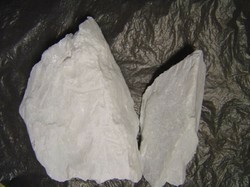 - We are having best quality talc lumps whiteness upto 99% for export and local use. Jai Vardhman Khaniz Pvt. Ltd.
Due to the structure of talc, it is a very suitable stone for carving. It is environment friendly and available in various shapes, sizes and colors. Available lumps with Jai come in Green, Black, Red and White colors. Application: Talc powder for HM, talc powder for Raffia, soapstone powder for Carry bags etc. We are the most trusted name amongst the topmost companies in this business, instrumental in presenting Talc Lump.